According to the Celiac Disease Foundation, “Celiac disease affects an estimated 1 in 100 people worldwide. The majority of those individuals (83%) are either undiagnosed or misdiagnosed. That means only 17% of people with celiac disease are correctly diagnosed. This is alarming given that studies show the later the age of diagnosis, the greater the chance of developing another autoimmune disorder, like Type 1 diabetes, thyroid disease and multiple sclerosis (MS). Furthermore, undiagnosed patients or those who do not maintain a strict gluten-free diet can develop serious medical conditions including heart disease, anemia, osteoporosis, infertility, epilepsy, migraines and in some cases, intestinal cancer. 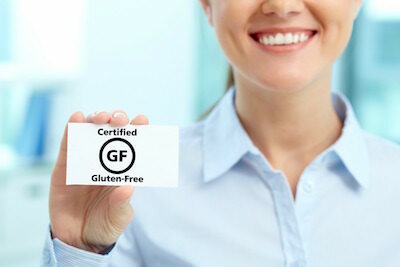 A gluten-free diet means excluding the protein gluten, which is commonly found in prepared foods. If you want to try a healthy gluten-free diet, you do still have to include whole grains. This includes brown rice, buckwheat, quinoa, amaranth, and specialty gluten-free oats. They are rich in fiber, antioxidants and minerals such as magnesium, selenium, calcium, and vitamins B6, E and niacin. The U.S. Department of Agriculture recommends that you eat at least three servings of whole grains each day. It’s easy to do if you eat brown rice instead of white rice, trade rice noodles for wheat-based pasta and make your sandwich with whole-grain gluten-free bread instead of bread made with wheat flour. Thankfully, more and more stores are stocking the products and ingredients to make foods to accommodate the gluten-free lifestyle. Breakfast is the most important meal of the day. So, start your day on the right foot with Three Bakers Avocado Toast made with Three Bakers gluten free 7 Ancient Grains. This is one of our favorite smoothies that we love to make for a morning snack or as an addition to a healthy breakfast. It is both delicious and nutritious with loads of vitamin C and potassium. 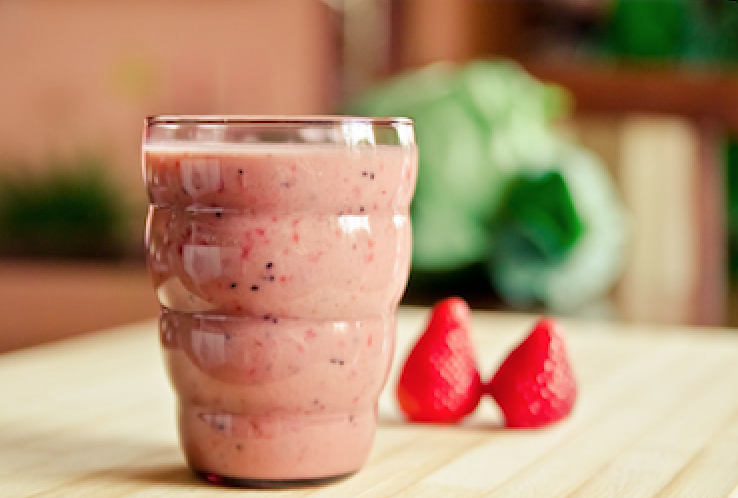 Use low fat yogurt as a base, combine all fruits and blend everything together until smooth. A strata – it is simply an Italian-style quiche using bread cubes instead of pastry crust. This strata is packed with plenty of spring vegetables such as asparagus, leeks, and mushrooms, however, feel free to use your favorites. Try using sautéed zucchini with ham and roasted red peppers and onions. Can’t do dairy? Simply swap out the milk for an unsweetened dairy free alternative and the cheese for your favorite dairy free cheese replacement. Spread Three Bakers Max-Omega Bread cubes in pan. Spread cooked sausage crumbles over bread cubes. Set pan aside. Heat remaining oil in skillet. Add asparagus, sprinkle with 1/2 tsp. each salt and pepper and cook stirring occasionally, until the spears are bright green and tender, about 3 minutes. Spread asparagus over sausage in baking pan. Add mushrooms to pan and cook until tender. Sprinkle mushrooms over asparagus. Sprinkle shredded cheese over vegetables. Top with leeks. 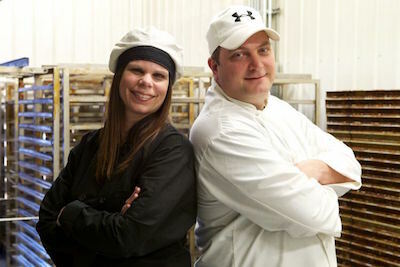 When ready to bake, preheat oven to 350 degrees F. Allow pan to sit on the counter while the oven is preheating. Bake strata until egg sets and the top browns, 40-50 minutes. Let cool for 10 minutes, cut into square pieces, and serve. The sweetness of tomatoes is a wonderful foil to the distinctive bite of horseradish and watercress. 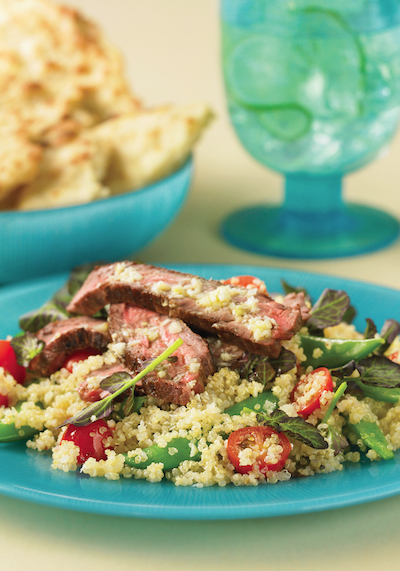 Thin slices of skirt steak (quickly seared in a skillet), round out this inventive salad. Tip: To mash garlic, working with one clove at a time, place the side of a chef’s knife flat against the clove. Place the heel of your hand on the side of the knife and apply pressure so that the clove flattens slightly (this will loosen the peel). Remove and discard the peel, then roughly chop the garlic. Sprinkle a pinch of coarse salt over the garlic. Use the flat part of the knife as before to press the garlic against the cutting board. Repeat until the garlic turns into a fine paste. The mashed garlic is now ready for use in your favorite recipe. In a large saucepan of boiling salted water, cook quinoa for 11 minutes. Add peas and boil for 1 minute. Drain and rinse under cold water until cool. In a small bowl, whisk together garlic, 3 tbsp. (45 ml) of the oil, horseradish and vinegar. In a large bowl, combine quinoa mixture, tomatoes, and 2 tbsp. (30 ml) of the dressing, gently tossing to combine. Season to taste with salt and pepper. Separately cover and refrigerate salad and the remaining dressing while preparing steak. Generously season steak with salt and pepper. In a large, heavy skillet, heat the remaining oil over high heat. Add steak and cook, turning once, for 3 to 4 minutes per side or until crusty and medium-rare, or to the desired doneness. Transfer steak to a cutting board and let rest for 5 minutes. Thinly slice across the grain on a slight diagonal. Add watercress to the quinoa mixture, gently tossing to combine. Divide salad among four plates. Arrange steak on top. Drizzle with the remaining dressing. We hope you enjoy our One Day Without Gluten plan! Let us know how you like it.